Copper, a naturally occurring element, has long been revered for its aesthetic value and positive effects on human health and wellness; its illustrious history of beauty and function dates back over 10,000 years. Throughout the ancient Egyptian, Greek, Aztec, and Roman Empires, copper was used to sterilize drinking water and treat illnesses, worn as jewelry, shaped into ornamentation for the home, crafted into art, and forged into currency. During the industrial age, copper obtained a new importance as a conductor of electricity and today it is considered the premium in quality for plumbing and telecommunication wiring. Copper has and continues to play a vital role in shaping our lives. 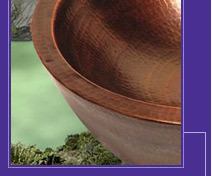 Today The Copper Factory is bringing the rich tradition of copper to homes across the country and beyond with a comprehensive line of hand crafted bathroom and kitchen sinks, bathtub and other accessories. Starting with native copper, experienced craftsmen hand hammer or sand cast each piece to create durable, hygienic and above all, attractive product offerings that suit a variety of life styles, from traditional farmhouses to contemporary urban lofts. Welcome to the experience of The Copper Factory.